We are living in a “post-truth” world. In fact, Oxford Dictionaries crowned the compound adjective the 2016 word of the year. Here’s how the dictionary used the word in a sentence: “In this era of post-truth politics, it’s easy to cherry-pick data and come to whatever conclusion you desire.” It would appear we’ve moved on from the “truthiness” of 2006 to post-truth. There’s the picked-over discussions over fake news on Facebook. Mark Zuckerberg said the company’s working on it. A fake-news writer told us why he peddles it. And The New York Times warned how all of this will come back to haunt traditional media. 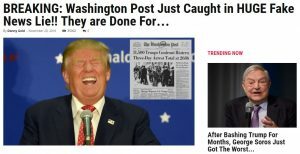 Look no further than LibertyWritersNews.com, a fake-new site The Washington Post profiled over the weekend. Screenshot of an article published on LibertyWritersNews.com that has since been taken down. Meanwhile, President-elect Donald Trump, who has been “nearly invisible” to the public, has largely left journalists to speculate — often incorrectly — over his picks for Cabinet. Is it Nikki Haley? Is it Jeb Hensarling? Who knows? Guess Who! We invite you to distract yourself from the guesswork and falsehoods with five important stories you won’t find on World News Daily Report, one of many sites that traffic in fake news. 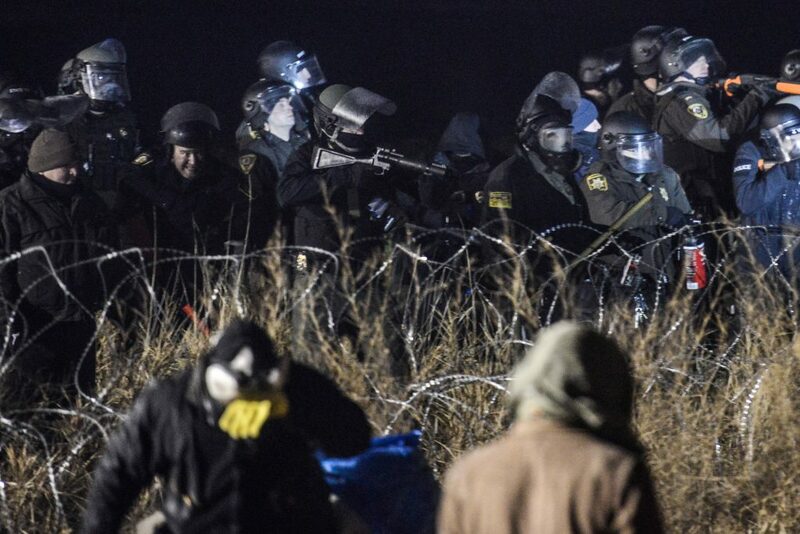 During an hourslong standoff Sunday night, law enforcement officials used water hoses and tear gas against activists protesting the Dakota Access oil pipeline. Since last spring, protests against the pipeline have swelled at the construction site in rural North Dakota, but also across the country. Now, protesters must prepare for winter. In October, journalist Jenni Monet, who has been closely covering the protests from the ground, said there was a noticeable increase of “intensity” with the law enforcement presence there. Reinforcements had come from other states to support the sheriff’s office, while protest camps expanded to welcome people who supported the Standing Rock Sioux Tribe. The sheriff’s office told The Bismarck Tribune that the overnight clash continued into Monday morning, adding that protesters threw rocks and burning logs at the police. 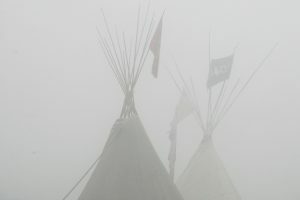 Jade Begay, an IEN spokeswoman told The Guardian that more than 160 people were injured and another seven were transported to a hospital for treatment. At least one person was arrested, The Associated Press reported. The sheriff’s office also told Monet that it hasn’t received reports that any of the protesters were injured. 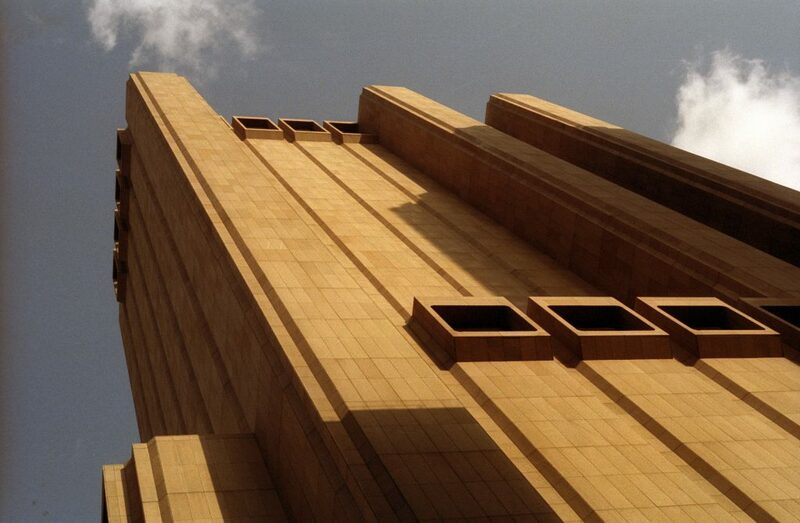 Known as the “Long Lines Building,” the windowless Brutalist building pictured above has been a fixture in the New York skyline since its completion in 1974. The 550-foot building, located on 33 Thomas Street in Lower Manhattan, was originally created to house AT&T phone lines and withstand a nuclear blast. Last year, the Times and ProPublica noted the close relationship between the telecommunications giant and the National Security Agency, with AT&T granting the intelligence agency access to billions of emails on its domestic networks, among other scores of data. An article published jointly by The New York Times and ProPublica reports that AT&T demonstrated an “extreme willingness to help” the NSA, according to documents from Edward Snowden. Among other revelations, the article reports that AT&T forwarded a million emails and handed over a billion cell phone records to the NSA. Pro-Publica reporter Jeff Larson joins Hari Sreenivasan to discuss. The Intercept said the conclusion that the building was an NSA hub was gleaned from interviews, public records and documents provided by Edward Snowden, the former intelligence contractor who leaked information about the agency’s vast surveillance programs in 2013. Their investigation, complemented by a 10-minute documentary film called “Project X,” revealed how NSA travel guides instructed their employees and contractors to coordinate a visit to the building, whose code name is “TITANPOINTE.” “Project X” was how the original architect referred to the building in his drawings. An excerpt from Henrik Moltke and Laura Poitras’s “Project X. “When traveling to TITANPOINTE, NSA employees are told to hire a ‘cover vehicle’ through the FBI, especially if they are transporting equipment to the site,” The Intercept reported. “In order to keep their true identities secret while visiting, agency employees are instructed not to wear any clothing displaying NSA badges or insignia,” their report added. An AT&T spokesman told the Times that the company does not grant government agencies control of its networks to collect information from its customers. Almost two weeks ago, India’s Prime Minister Narendra Modi announced during a televised address that the country was discontinuing the circulation of 500- and 1,000-rupee notes in an effort to stop counterfeit money. “Black money and corruption are the biggest obstacles in eradicating poverty,” Modi is quoted as saying in a Reuters story. The surprise move from the prime minister provoked a mad dash of hundreds of thousands of people to line up outside ATMs and banks wanting to replace their now-banned currency with the new 500- and 2,000-rupee notes. “By making high denomination bank notes worthless overnight, the government hoped that those who had black money in this form would not be able to convert it into physical assets like gold,” BBC explained. The Times reported that nearly a third of all business in the country — from real estate to wedding services — rely on black money. The discontinued rupees accounted for more than 80 percent of the country’s circulated currency, Reuters reported. The lines also remained exceptionally long days after the initial announcement. 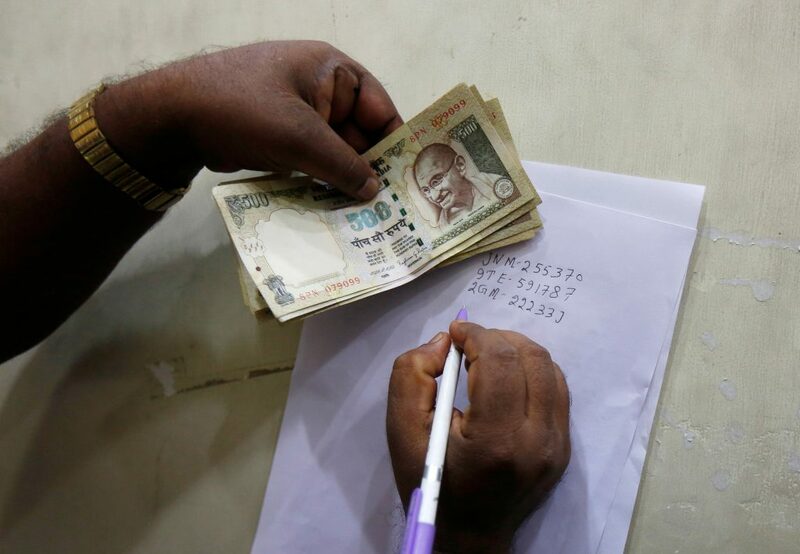 People have until late December to exchange their rupee notes, but many of those affected said the government’s decision was a long-term one that didn’t keep regular people in mind. “I have three 500-rupee notes and only about 40 rupees (about 60 cents) in small change,” student Ankit Saini told AP shortly after the announcement. “I can either buy lunch or a bus ticket home … But what will I do tomorrow?” he said. There have also been dozens of reported “demonetization deaths” in the fallout of the decision, but many others have been difficult to verify. 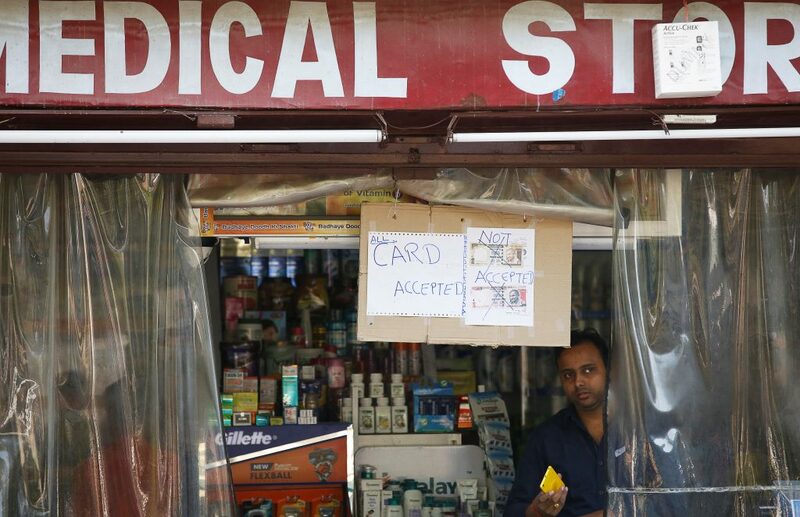 Last week, one Indian doctor held a news conference to say that reports of him dying of a heart attack amid the country’s cash crisis were wrong, BBC reported. The mission to regain control of Mosul from Islamic State militants has now entered its sixth week. 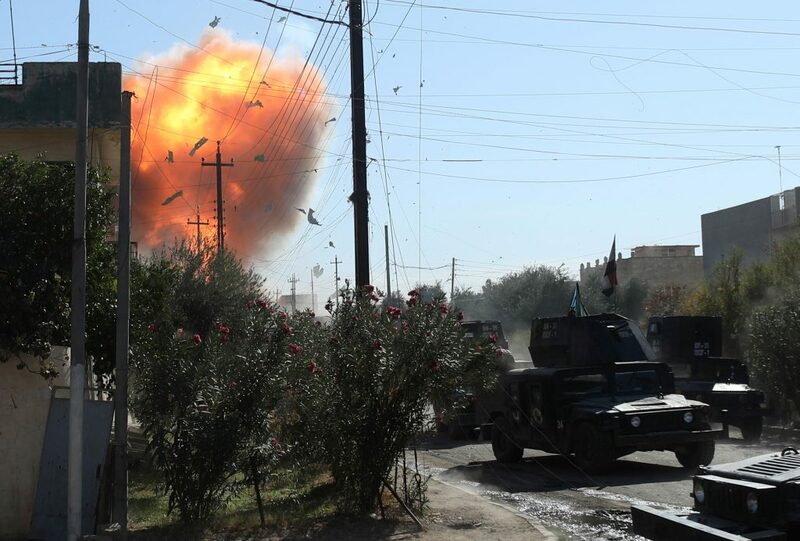 In October, Iraqi and Kurdish forces, supported by airstrikes from the U.S.-led coalition, launched an offensive in the hopes of wrestling control of Iraq’s second-largest city from ISIS, which had two years to advance its battle strategy. In her report last week, special correspondent Jane Ferguson documented what she saw while shadowing Iraqi special forces over several days at the front lines. Ferguson said ISIS has resorted to deadly warfare techniques like car bombs, IEDs and planted bombs in an attempt to slow the army’s advance into the city. As the mission to retake Mosul rages on, Iraqi forces and their allies must deal with extremely deadly warfare techniques, including car bombs, explosives hidden in underground tunnels and booby-traps. Special correspondent Jane Ferguson reports from Mosul. 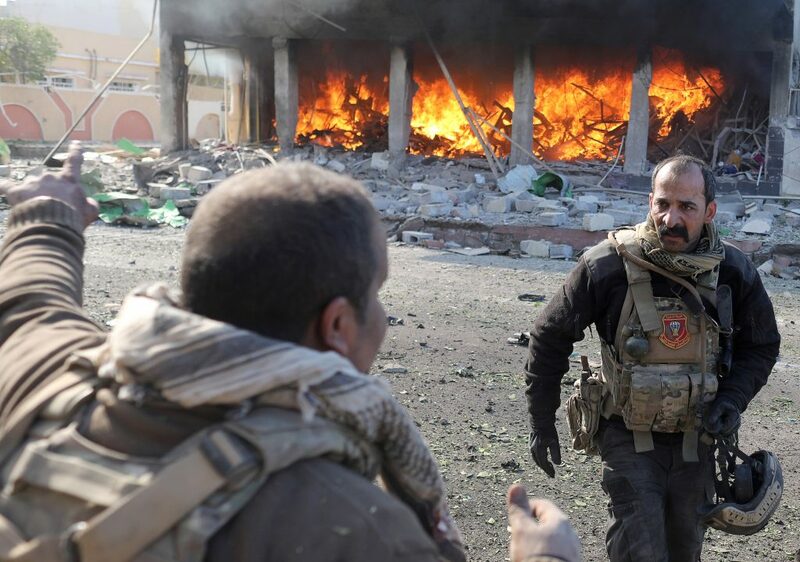 “The most dangerous thing ISIS is using is the car bomb,” Maj. Ziad Al Gubere told the NewsHour. “Also they have a new style, using drone-carried bombs. They can control them with the remote. They use a small amount of explosives. They target our cars and groups of us. The Iraqi Special Operations Forces, elite troops trained at an American base, are “not just the tip of the spear for the Iraqi forces [in Mosul], but the dominant group fighting block by block in the city,” NPR’s Alice Fordham reported. As one Iraqi special forces commander explained to NPR, once cities started to succumb to ISIS control, it was these elite troops who were asked to help out. But these soldiers weren’t originally trained to do day-to-day battles. They were meant to target ISIS leaders. They’re also a “very finite resource,” Fordham added. 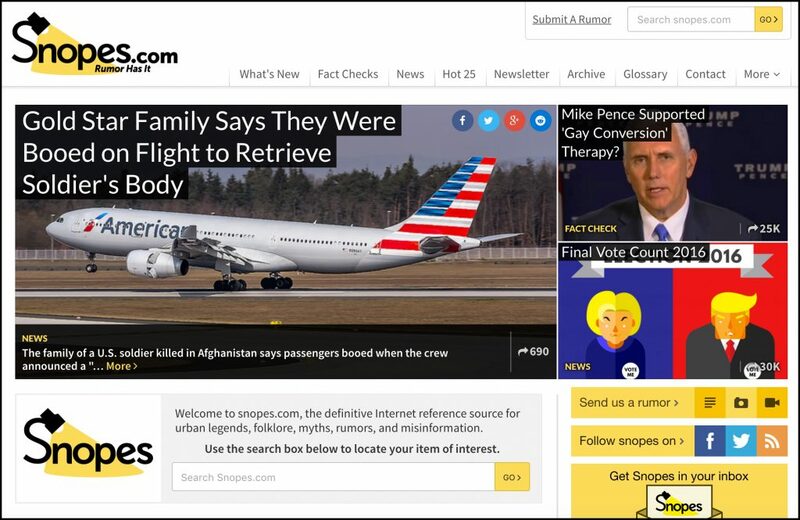 A screenshot of the Snopes.com homepage on November 21, 2016. The website is owned and run by David and Barbara Mikkelson, who started the site when the internet was still in its infancy in the 1990s, before search engines were a go-to source for debunking. As for politics, it “wasn’t until the 2000 election when I saw the first political pieces come out that lent themselves to debunking,” David Mikkelson said. A screenshot of an debunked story on Snopes.com. After years of myth-busting, eventually an email chain would surely end up targeting the website itself. In 2009, a widely circulated email chain claimed that the Mikkelsons were “very Democratic” proprietors who pushed a liberal agenda. But another fact-checker, FactCheck.org, took up that claim. The verdict? The so-called expose contained falsehoods. “We reviewed a sampling of their political offerings, including some on rumors about George W. Bush, Sarah Palin and Barack Obama, and we found them to be utterly poker-faced,” FactCheck.org wrote. According to public records, David Mikkelson never stated a political affiliation. Also, Barbara Mikkelson is a Canadian citizen. “You’d be hard-pressed to find two more apolitical people,” David Mikkelson told FactCheck.org. In a column on the Post website, Snopes.com’s managing editor Brooke Binkowski said the website is a source for people to do their own research. Now, read the story of Kyle.